Summertime is made for salads, and every once in awhile you are introduced to one that is just down right, out of this world amazing. Had I seen the ingredients before I tasted it, I would never have thought to try this salad, but when my children downed helping after helping, I knew it was winner. The dressing should just be available to drink, it’s that good and truly makes the salad. I’ve had this numerous times at potlucks and every single time, the bowl is licked clean and people are begging for the recipe. You never knew that would happen with a salad, did you? My mouth is watering so I think this recipe is calling my name. Mix the dressing ahead of time so that the flavors can blend overnight. Add the apples, almonds and the cheese to the lettuce immediately before serving (it will get soggy if you add them too early). 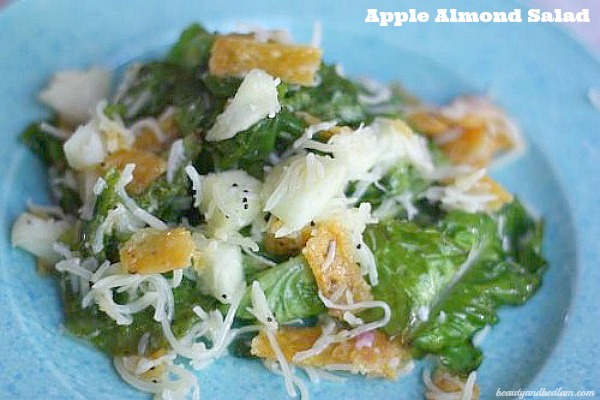 *My friend, Leah, who shared this recipe was missing the almonds when I first tried it. Instead she topped the salad with the nacho cheese flavored Texas Toast bits that she got for super cheap with her double coupons, and it was also amazing. Looks like a tasty salad! Tons of oil though! Awesome that the kids liked it, that’s always good! Yum! Looks like the perfect summer salad!